If you have problems with laundry, you probably don't understand the properties of different types of fabrics. The fiber content and how the fabric is manufactured makes a huge difference in stain removal and how the garment should be cleaned. For the best laundry results, it is good to have a working knowledge of fabrics. 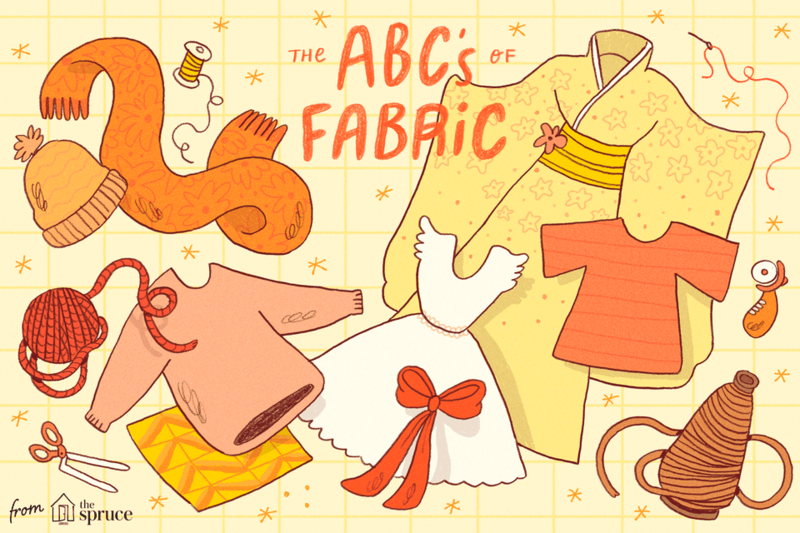 This glossary of types of fabric will help you interpret clothing care labels. A manufactured fiber refined from cotton filaments or wood pulp and acetic acid that has been extruded through a spinneret and then hardened. A type of nylon made by DuPont®. Bamboo fabric is made from the pulp of the bamboo grass. It is light and strong, has excellent wicking properties, and some antibacterial properties to reduce odors. Bamboo fabric has insulating properties to keep the wearer cooler in summer and warmer in winter. A crisp, fine linen that is sometimes called altar cloth and used for that purpose. A term applied to a yarn or a fabric that is made up of more than one fiber. In blended yarns, two or more different types of staple fibers are twisted or spun together to form the yarn. Polyester/cotton is an example of a typical blended yarn or fabric. Wool fabric that is processed in hot water and felted to create a very dense final product used for coats, jackets, and slippers. This fabric can be a knit or a woven but is made with a novelty yarn. The finished fabric has protruding loops or curls on the surface. Care must be used when cleaning to prevent snagging. Carbon-infused fibers created by burning bamboo are blended with a synthetic fiber to create a durable, high-tech fabric that is anti-bacterial, anti-fungal, breathable, and moisture-wicking. A lightweight silk or silk-like fabric. A soft fuzzy fabric developed in France where chenille translates to "caterpillar". It can be made from cotton or a blended fiber. An extremely sheer, lightweight, soft fabric made of silk, polyester, rayon, or other fibers. It is made of highly twisted filament yarns. This is a study plain or twill weave cotton fabric. Most of these fabrics are dyed a khaki color but can be navy, black, or olive drab. A glazed cotton in a plain weave. Chintz has bright colors and prints, often florals. Fabric made with cotton fibers that are combed to remove short fibers and any debris. Combing results in a cleaner, more uniform, and lustrous yarn. A polyester fiber designed to move moisture away from the body and out onto the surface of the garment for quick evaporation. Usually made from cotton, corduroy is a durable pile fabric with lengthwise ridges cut into the pile called wales. Corduroy is also available as a cotton/polyester blend to help prevent wrinkles. A natural fiber that grows in the seedpod of the cotton plant. Fibers are typically one-half to two inches long. The longest staple fibers, longer than one and one-half inch, including the Pima and Egyptian varieties, produce the highest quality cotton fabrics. A hard-spun two-ply cotton yarn made from long staple fibers and treated to remove all short fuzzy ends for a smooth finish. Lisle is a popular choice for fine men's knitwear, including tops and socks. Damask refers to the type of weave used to create jacquard-woven florals or geometric designs. The fabric can be made from cotton, linen, polyester, or from blended fibers. A knit fabric in which two layers of loops are formed that cannot be separated. A double knit machine, which has two complete sets of needles, is required for this construction. Ecosil means the polyester fibers are spun very compactly to give the fabric a clean appearance and a resistance to pilling and abrasion. All cotton grown in Egypt is "Egyptian" but not all of it is extra-long staple cotton which is the most desirable and softest. Elastane is just another name for spandex. The word "elastane" is used in Europe while "spandex" is used in the United States. Elastane/spandex trade names are Lycra and Dorlastan. A type of fabric with patterned cut-out designs around which stitching or embroidery is applied in order to prevent the fabric from raveling. It can be made from cotton or man-made fibers. A glossy, soft, finely-ribbed silk-like woven fabric made from cotton, silk, or manufactured fibers. A circular knit fabric with a looped pile back and smooth face. The fabric can be a natural fiber like cotton or bamboo or a synthetic fiber. A sturdy fabric with a twill weave that can be made of cotton, wool, or synthetic fibers. Fabric that attracts water and is absorbent. Fabric that tends to repel water. A rib stitch variation, interlock stitch fabrics are thicker, heavier, and more stable than single knit constructions. A very high quality knit fabric with 4-way stretch that comes from Italy. Italian nylon includes some Lycra to give great stretch and recovery, abrasion resistance, and anti-bacterial qualities. Any fabric that has a pattern woven into the fabric rather than printed on the surface is a jacquard. Brocade and damask are types of jacquard woven fabrics. The fabric can be made with natural or synthetic fibers. A double-knit fabric in which a Jacquard type of mechanism is used. This device individually controls needles or small groups of needles and allows very complex and highly patterned knits to be created. A generic term for a plain knit fabric without a distinct rib. Originally made of wool, jersey fabric was first manufactured on the island of Jersey. Today jersey can be knit from many different types of fibers. Knit fabrics are made the same way a scarf is hand knit at home. Knitting is a process that loops a piece of yarn in a row a few times, then links those loops with another row of loops and so on. Knit fabrics are naturally stretchy because of the loops whether made from natural or man-made fibers. A netlike ornamental fabric made by looping, twisting, or knitting thread in patterns by hand or machine. The fabric can be made from natural or synthetic fibers. A woven fabric using flat silver or gold metal threads to create either the design or the background in the fabric. Latex is made with rubber and thus has rubber-like qualities. It is used in some fabrics to provide greater elasticity. A fabric made from fibers obtained from inside the woody stem of the flax plant. The fibers are much stronger and more lustrous than cotton. Linen fabrics are very cool and absorbent but wrinkle very easily unless blended with manufactured fibers. Linen is one of the world's oldest textile fibers. The name is given to material sewn into the inside of a garment to make it more opaque or more comfortable against the skin. Lining fabrics can be made of natural or man-made fibers. Lycra is the trademarked spandex fiber produced by DuPont. It is lightweight and soft, but stronger and more durable than rubber and is used in compression garments, swimwear, and bras. Lyocell is a cellulose fabric obtained by an organic solvent spinning process. This fabric is a sub-category of rayon. Tencel is the trademark name for lyocell. Memory foam is often used to give shape to a garment. It is made of extruded polyurethane as well as additional chemicals. Cotton that has been through a wet finishing process, which swells the yarns of the fabric to give it a round smooth surface and stops the cotton from further shrinkage. This process results in a stronger and more lustrous yarn that is more easily dyed, producing brighter, deeper colors. Merino wool comes from certain sheep that produce a wool fiber that is long and fine. The result is a fabric that is thin, soft, and luxurious. Micro Modal® is a trademarked microfiber from an Austrian textile company, Lenzing, made from spun beechwood cellulose. The fabric is delicate and light. Fabric made with microfiber means that the fabric’s filaments are extremely fine and usually a blend of polyester or polyamide (nylon) fibers. Microfiber fabrics are lightweight, and look and feel luxurious. Microfleece is an ultra-soft synthetic wool-like fabric. Modal is made with cellulose from beech trees and is essentially a variety of rayon. Garments made from modal have anti-crease properties and are relatively easy care. A synthetic rubber fabric used for swimwear, outerwear, and high fashion clothing. A completely synthetic fiber, nylon is known for its superior flexibility and excellent resilience. A velvet-like fabric that has been flattened to achieve the desired design or look. A heavy twill-weave satin fabric, made of silk fibers or a manufactured fiber. Pima cotton grown in Peru and harvested by hand, which reduces the scratchy impurities and guarantees a more brilliant white shade that can be easily dyed. Pima cotton is a generic name for extra-long staple cotton grown in the U.S., Australia, and Peru. The name honors the Pima Indians who grow cotton for the U.S.Department of Agriculture in Sacaton, Arizona. A medium-weight fabric, either knit or woven, with raised dobby designs including cords, wales, waffles, or patterns. Woven versions have cords running lengthwise, or in the warp direction. Knitted versions are double-knit fabric constructions, created on multi-feed circular knitting machines. The basic fiber-forming substance for nylon fiber. It is also the European term for nylon. This is both the name of a fabric and a fiber. Polyester has high strength, excellent resiliency, and high abrasion resistance. Low absorbency allows the fiber to dry quickly. This is a two-way stretch nylon fabric used in high-end compression garments. A silk-like fabric made from wood pulp or other vegetable matter. It is a weak but comfortable fabric against the skin and absorbs moisture. A knitted fabric with alternating raised and lowered rows, it is more elastic and durable than plain knits. Patented by Cluett, Peabody and Co., Inc,. the label means the cotton fabric shrinkage is held to just one percent. A woven type of fabric with the characteristic of being highly lustrous on one side, and matte on the other. Can be made in a variety of fibers. A rubber-like polymer, which maintains its elasticity over a wide range of temperatures. Often used inside the top of lingerie to make it cling to the skin. A natural filament fiber produced by the silkworm in the construction of its cocoon. Most silk is collected from cultivated caterpillars and comes from Asia. Soy fabric is made from the leftover dregs from soybean oil or tofu production making it eco-friendly. Similar to natural silk, it is common to find occasional slubs which add to its natural beauty. Its care is the same as cotton fabric. A synthetic fiber made from polyurethane. It is lightweight, highly elastic, strong, durable and non-absorbent to water and oils. In Europe, they call this elastane. A natural rubber latex/nylon stretch fabric with thousands of air holes for comfort and breathability. The name "Supima" is a licensed trademark of a group of cotton growers. It is a 100 percent American Pima cotton. Supplex nylon is made by DuPont®. It is a cottony soft nylon that offers the performance benefits of a man-made fabric with the look of cotton. Tactel nylon is made by DuPont. It is a silkier, softer nylon with a crinkle finish. It is lightweight and quick drying. Tencel is the trademark name for lyocell. A synthetic fiber with a hollow core to keep you warmer and drier by wicking moisture away. This word comes from the French word "tricoter" which means to knit. Tricot is a finely knit fabric that stretches in both the lengthwise and crosswise directions. It can be made from nylon, wool, rayon, silk, cotton, or other fibers. Soft plush fabric with a close, dense pile. It can be made from cotton or a synthetic fiber. Velvet is a woven fabric made of silk, nylon, acetate, or rayon with a thick, soft pile of cut or uncut loops. A similar fabric, velveteen, is made the same way but from cotton. The European term for rayon. A shiny, plastic-coated fabric typically made with a woven backing of polyester fibers that are then coated with polyvinyl chloride or a blend of PVC and polyurethane. Wool is a natural fiber that comes from the fleece of a sheep, goat, llama, or alpaca. It can be knitted or woven. Woven fabrics are made from two pieces of yarn that are stretched out over a loom and woven together in both horizontal and vertical directions. Woven fabrics do not stretch because their fibers run at 45-degree angles to one another. Woven fabrics include linen, denim, twill, satin, chiffon, corduroy, tweed, and canvas. X-Static silver fiber has a layer of pure silver permanently bonded to the surface of a textile fiber. It can be used in knits, wovens, and non-wovens as either a filament or spun yarn. The addition of silver creates an anti-odor, anti-bacterial fiber. My Shirt Is Made of Viscose. What Is That and How Do I Clean It? This Is a Natural Fiber Shirt, Can I Wash it? This Shirt Says It Made From Modal. How Do I Wash it? How Do I Wash Clothes Made From Bamboo? What is Brocade Fabric and How Do I Clean It?